Dhokla is a deliciously soft and spongy snack prepared from rava/semolina, generally served with green mint chutney. There are two methods to male at home, either using the traditional fermentation method or using Eno fruit salt as a rising agent. This recipe follows the second approach. Making soft and spongy dhokla is an art and Ritu in her demonstration with valuable tips made it look easy. Roast rava for a while. Make it cool. Mix rava and curd in one bowl and beat them until smooth. Make sure that there are no lumps. Let it set for 15-20 minutes. Add few more curd as Sooji will soak the curd and becomes thick. At last, add salt, turmeric, and oil. Beat it again until the batter becomes smooth. Add the fruit salt, stir gently then sprinkle red chili powder. Pour it immediately onto the greased tin and place the tin into the steamer. Steam for 20 minutes. After that remove the tin from steamer and keep it aside. Heat the oil for the tadka, add the rai, curry leaves and green chilies. Saute until they are slightly colored. 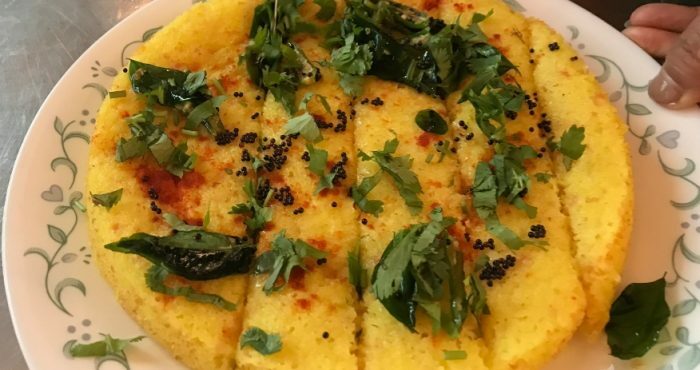 Cut the dhokla into desired sized pieces and pout the tadka over. Garnish the dish with coriander.